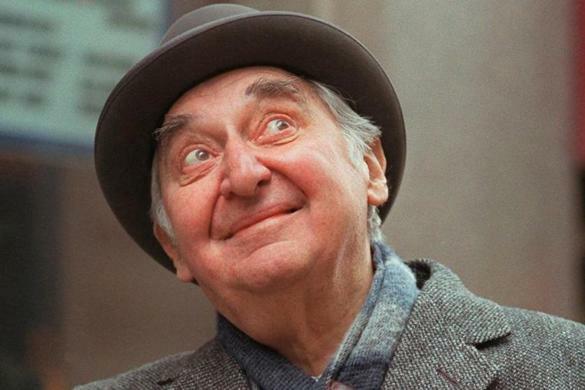 Fyvush Finkel of "Boston Public" and "Picket Fences"
Orthodox actor, Stephen Hill in "Law and Order"
"Rabbi" Gene Wilder and Harrison Ford in "The Frisco Kid"
who portrayed Jewish characters Leo Bloom in "The Producers," and Rabbi Avram Belinsky in "The Frisco Kid." Producer, Mace Neufeld may be best-known for having produced Tom Clancy's "Jack Ryan" political thrillers. 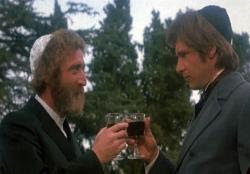 At the Israeli Film Festival 2014, we asked him background about his 1979 classic,"The Frisco Kid" which starred Gene Wilder and Harrison Ford. We asked him why since that release are films which depict Jewish life and customs, as he did with "The Frisco Kid," so rare. 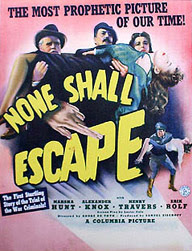 "None Shall Escape" (1944) was the first American movie which depicted European anti-Semitism and Holocaust activities. It was screened by the L.A. Jewish Film Festival this spring. Watch Q&A with Director of UCLA Film & Television Archive, Dr. Jan-Christopher Horak in conversation with Hilary Helstein, Exec. Director, Los Angeles Jewish Film Festival. 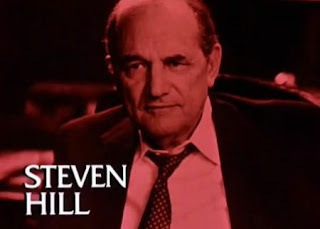 Restored-film courtesy of Sony Pictures Entertainment. CineCon (running in Hollywood September 1st through Labor Day) will screen this seminal, American-produced, anti-Semitism expose, "None Shall Escape" with a visit from co-star, Marsha Hunt. CineCon VP Stan Taffel explains that this film paved the way for Charlie Chaplin to become the first Hollywood star to produce a movie with an anti-Nazi message. This opened the door for others to address anti-Semitism in and after World War II in motion pictures. 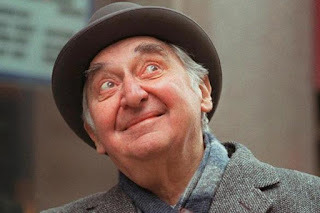 Mr. Taffel discusses the irony of Max Davidson a German film actor known for his comedic. Jewish persona during the silent film era. 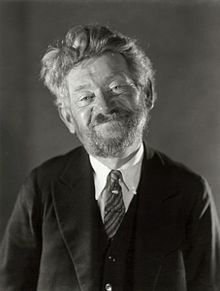 In an article on Laurel-and-Hardy.com, hstorian Richard Bann asserts that Davidson's career was scuttled by MGM chiefs Louis B. Mayer and Nicholas Schenck, who objected to his portrayal of a stereotypical (and more importantly, unassimilated) Jew and forced Roach to terminate him shortly after sound arrived. 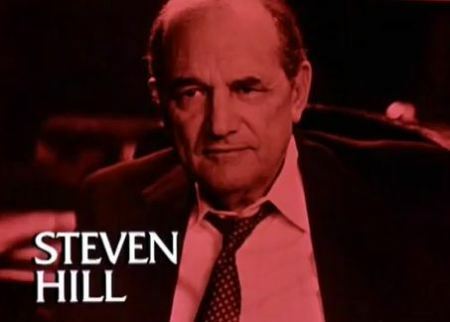 As the three who passed this week have proven, the role of the Jew in American film and TV has come a long way. With its decades-long legacy playing in the Jewish-deli capital of America, the former Brooklyn Dodgers never brought the tradition of kosher hot dogs to Elysian Park. This left many kosher-observant, night-game attendees empty-stomached. With Sandy Koufax back as a pitching consultant, and centerfielder, Joc Pederson on the roster, did new President & CEO, Stan Kasten, finally bring the momentum to add the club to the list of Major League Baseball stadiums offering kosher food at the ballgame? Despite the city's large number of Jewish emigrants from the Northeast, L.A.'s Dodger Stadium hasn't offered much for those with a taste for a traditional-deli frank. The staple, Farmer John "Dodger Dog" contains "traif"- pork. While some stands sell a more expensive "All-Beef" variety, brown-mustard has become rare to find- and no sauerkraut at all- the only vegetable condiments are minced, raw-onions and pickle relish. How well does Americas 2nd most populous Jewish town accomodate kosher diners at the ball park? NYC-raised, sports radio host, Vic "the Brick" Jacobs (AM570) discusses the LA Dodgers players' dining idiosyncracies as we recognize Dodger Stadium finally accomodating kosher attendees through the glatt, Jeff's Gourmet Kosher Sausages stand in the Right Field pavilion. After 35-years of importuning by civic-activists, like Stanley Treitel, Jeff's Gourmet Kosher Sausages of Pico Blvd managed to work-out a glatt-kosher concession arrangement with Dodger Stadium, to fill the void for kosher attendees. Long after a number of other cities stadiums accomodated kosher fans, Jeff's started in July 2015 and the 2016 is their first full season (closed for Sabbath observance Friday eve and Saturday). Rather than situating it in a central location, Jeff's Gourmet Kosher has been relegated to a barely marked booth behind the scoreboard in Right Field. Fans sitting in the upper decks have to travel down guarded stair levels (and back) just to procure a kosher frank in between innings. But, the word has gotten out that not only does Jeff's offer only kosher franks and sausages, they are a better meal than Dodger Dogs. Not only do they have brown mustard for their custom buns, they serve sauerkraut- and they'll even grill peppers and onions to top your wurst. What affect has Jeff's had on Dodger fans- both Jew and Gentile? Listen to Jewish actor Josh Malina ("The West Wing," "Sports Night") and father, Robert, relate how the Dodgers' kosher offering has enhanced their MLB game experience- among others' as well. The well-kept secret is that the kosher stand offers the best franks in the park. Look for Jeff's Gourmet Kosher Sausages in the Pavilion-area behind the Right-Field bullpen at Dodger Stadium- or on 8930 W. Pico Blvd, west of Robertson Blvd. The Dodgers hold their annual, Jewish Community Day on Sunday Aug 28, 2016. An Egyptian judoka is being pressured on social media not to show up for his scheduled Friday-afternoon fight against an Israeli contender at the Olympics in Rio, the Hebrew news site nrg reportedon Thursday. According to the report, in spite of repeated assertions from the chairman of the Egyptian Olympic Committee that Islam El Shehaby will appear on the mat for his slated match against Israeli judoka Or Sasson – going as far as to warn the athlete that, if he fails to do so, his Egyptian citizenship will be revoked – calls from fans on Facebook and Twitter for him to shun the fight have been intensifying. 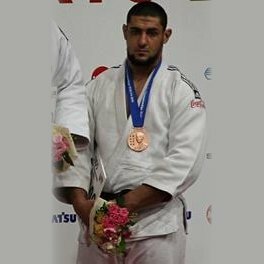 The 2010 World Judo Championship bronze medalist in the over-100-kilo category is supposed to fight Sasson, winner of two silver medals — one in 2015 and a second in 2016 — in the European championships. The controversy surrounding El Shehaby is not the first incident of its kind at the Olympic Games in Brazil. On August 5, the Lebanese delegation to the games refused to share a bus meant to take the athletes to the opening ceremony with the Israeli team. Subsequently, on Aug. 7, Saudi Arabian judoka Joud Fahmy forfeited her first-round match against Christianne Legentil from Mauritius, reportedly in order to avoid competing against Israeli contender Gili Cohen in the next round.